If you’ve bought or are looking to buy a cheap acoustic guitar, there are things you can do to make it sound better and feel nicer to play. 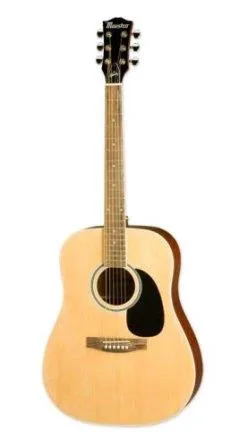 Though you can get some decent low priced guitars these days, a cheap acoustic will always be lacking somewhat when it comes to tone and playability. But often there are ways to make that guitar sound better – some of those ways are more simple and some are more complex and involved. Here are some of the ways you can go about improving your acoustic guitar. The following are a few things you can do to improve the sound of a cheap acoustic guitar. Chances are the strings you get on a cheap guitar will be less than ideal. Changing your strings is perhaps the thing that is the easiest and will make potentially the most difference. So this is a great place to start. Whilst you’re changing the strings there are some things you can do whilst the strings are off that will also help – so don’t rush to change those strings just yet! Not until you have considered whether you might want to do some other things. One of the easiest of those is changing the bridge pins. Often cheap guitars save cost by putting in cheap parts – such as for the saddle, nut, tuners and bridge pins. The bridge pins come in and out easily – they have to come out every time you change the strings anyway. And it doesn’t cost too much to get a new, better set. The tuners/machine heads won’t affect the tone of the instrument – but they can affect the ability of the guitar to stay in tune. Some very cheap tuners/machine heads affect the ability of the guitar to stay in tune. Whilst this doesn’t change the tone of the instrument, it certainly does affect how good it sounds when you’re playing it. Tuners/machine heads may not be the only thing that are affecting the guitar staying in tune but it may be as simple as replacing them to solve the problem – and that will make you sound better and avoid a lot of frustration. Also, it’s harder to tune if your machine heads/tuners stick or are difficult to turn. Nice machine heads/tuners are just way more pleasant to work with and way more likely to keep your guitar in tune. A little more difficult than replacing the bridge pins but replacing the saddle will make a greater difference to tone. If you have a cheap plastic saddle on your guitar, it’s a good idea to change to something of a higher quality – for better tone – like bone or something like TUSQ (an artificial material made to emulate bone). More difficult again than changing the saddle is changing the nut. The saddle usually sits loosely in the bridge – so it will drop out easily. However, the nut is glued in place – so it’s more difficult to remove. But if you have experience, are willing to learn or if you are willing to pay someone to do it, changing the nut can also make a difference to the tone of the guitar. 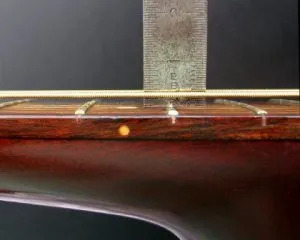 Either way – if you are changing the nut or the saddle, you’ll need to make sure that they are at the right height for the guitar so that your playability and intonation isn’t affected. That brings me to playability. As well as tone, there are a number of ways you can improve the playability of a cheap guitar. A lot of cheap guitars – and more expensive guitars for that matter – come with a “high action”. This basically means that the strings are high above the fretboard. This makes it more difficult to play – both physically and technically. Some people prefer a higher action – but most prefer a lower action. And for those that prefer a higher action, some cheap acoustics are too high even for them. This is something that you can learn to do yourself – though it will take a fair bit of learning. But it’s also something that you can pay someone else to do – which is the recommended method, in my opinion. But if you like doing things like this then it can be a fun experience. Whichever way you do it, it’s well worth doing because this alone can make a cheap guitar multiple times more pleasurable to play. There is also a chance that you get a guitar with an action that is too low. In this case fret-buzz might occur (where you get a buzzing sound in the string, when you press on certain frets). In this case you’ll most likely want to have the action raised. Changing the strings can not only make the guitar sound better – it can also affect playability. Cheap strings sometimes just don’t feel the same under the fingers as nicer strings. And if you’re a beginner you might want to try starting out with silk and steel strings – so that it’s easier on your fingers. 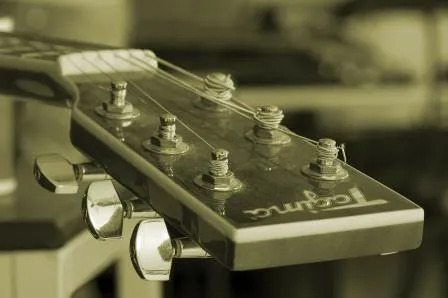 If you’re fretboard is too dry, then it might be an idea to oil it (again whilst your changing over the strings that the guitar came with – or when you’re changing to another set sometime down the line). A dry fretboard will make for a less pleasant feel than one that is properly oiled. There are other things you could do – like remove the top of the guitar and reshape the bracing – but that’s getting pretty extreme and beyond the skill and inclination of most guitarists – particularly someone who is buying a cheap guitar. Unless you are buying that cheap guitar to practice as a guitar builder/repairer. But for most of us a cheap guitar is bought because it is all we can afford or it’s all we are willing to invest. In which case the tips above are some practical ways to improve your guitars sound and playability – though it’s not an exhaustive list.